Maybe this page should be called 'other diversions' or 'my daft ideas'. These projects are either because of friends clearing out some old 'electronics junk', or because I saw some 'interesting' item going very cheap on eBay! 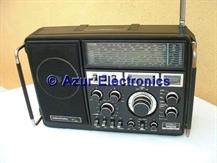 Often these projects are domestic items: Radios, Hi-Fi, TV's, PC's, VCR's, etc. These are all outside the scope of this website, but it is surprising that after a good clean-up and sometimes a repair, there is still a demand for this type of equipment. It's good that this equipment is recycled and makes someone else happy, plus it all helps to fund my electronics hobby, instead of ending up in a landfill site. A few years ago I was given a 80286 12MHz PC, which I temporarily sealed up in a box in my garage. Now it is working again. For details see Repair Commodore PC40-III. Although it is good fun to use DOS again and play some legacy games, it is has now been sold. This is also a link to my other hobby of building and repairing computers! 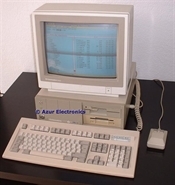 See Commodore PC40-III for details. Sometimes the equipment is outside my area of interest or expertise. This is true of all thermionic valve based equipment such as this Marconi 6600 Microwave Sweep Oscillator. In these cases I sell the equipment via this website or on eBay. The following projects are all 'opportunity buys' and maybe I should resist these to avoid filling my garage with old equipment. Either I will find a use for this equipment, or I will resell or scrap them for spares. 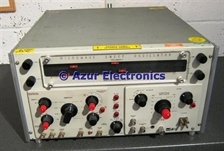 SWR measurements are often required in performance tests so I want to see how this equipment can be used: Evaluate HP 415E SWR Meter. A system to test RS-232/V24 Data Communications: Evaluate HP 1645A Data Error Analyser and Thurlby DA100 Protocol Analyser. Analogue video is now obsolete but I have some equipment to generate and display video: Evaluate Black Star Orion PAL TV & Video Pattern Generator and Goodmans C530 6" Colour TV/Monitor with Remote Control.